Olympus Corporation is pleased to announce the addition of three more firms to the roster of companies supporting the Four Thirds System standard for digital SLR camera systems. The three firms (in alphabetical order) are: Matsushita Electric Industrial Co., Ltd. (best known for its "Panasonic" brand products), Sanyo Electric Co., Ltd., and Sigma Corporation. The Four Thirds System standard continues to be open to all, and the participation of additional firms is being encouraged. The Four Thirds System standard defines a standard for the design and development of an entirely new generation of digital SLR camera systems and was established in an effort to fully realize the potential user and performance benefits offered by modern digital imaging technology. The Four Thirds System uses a four-thirds-type image sensor, making it possible to design extremely compact lenses that also have the optical characteristics needed to maximize sensor performance. In addition, the system defines an open standard for lens mounts that provides consumers with a wider range of choice by assuring compatibility between Four Thirds System bodies and lenses produced by different manufacturers. 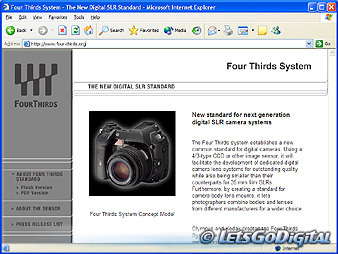 In October 2003, Olympus introduced a range of Four Thirds System products that included the E-1 interchangeable-lens-type digital SLR and other Olympus E-1 System components. The Four Thirds System standard was announced in September 2002 by Olympus Corporation and Eastman Kodak Company of the United States, and has been supported since its inception by Fuji Photo Film Co, Ltd. In the future, we will continue to promote industry-wide participation by encouraging other manufacturers to join in developing this open standard to the benefit of all.